Thirucherai is one of the 108 Divya Desams of Lord Vishnu also known as Pancha Sara Kshetram situated 15 kms from Kumbakonam and 3km south of Nachiyar Kovil in the District of Thanjavur, Tamil Nadu. Lord Perumal grants darshan to devotees in a standing posture facing east. 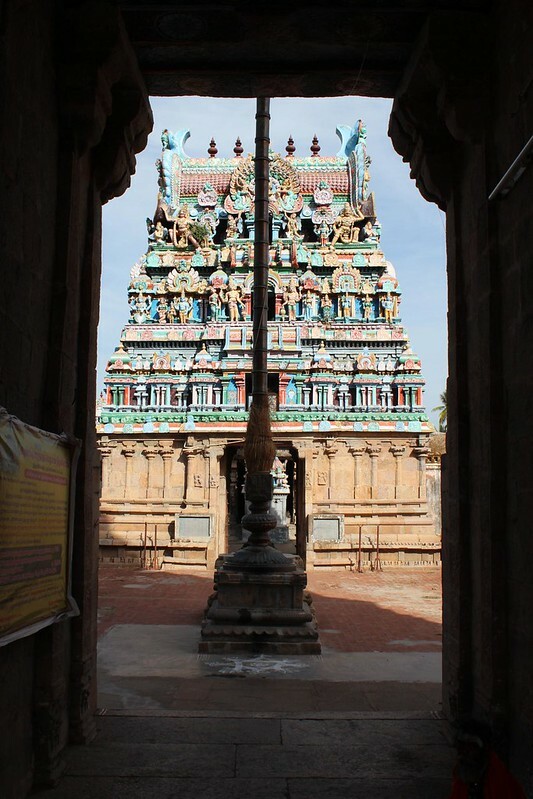 The vimana above the sanctum sanctorum is known as Sara Vimana. Mother Cauvery was granted darshan by Lord. The length of the temple is 380 feet and the width 234 feet. 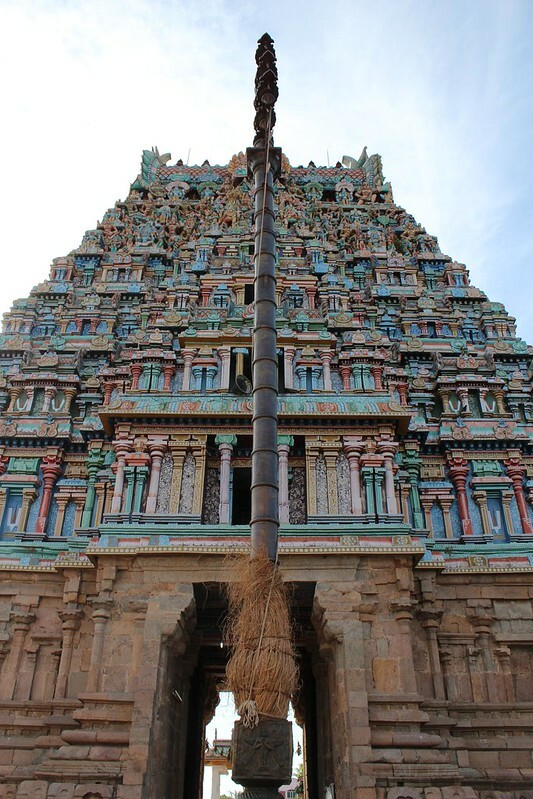 The Rajagopuram is 90 feet tall. There are shrines for Sage Agasthya, Lord Brahmma and Mother Cauvery on the western bank of Sara Pushkarini opposite the temple. 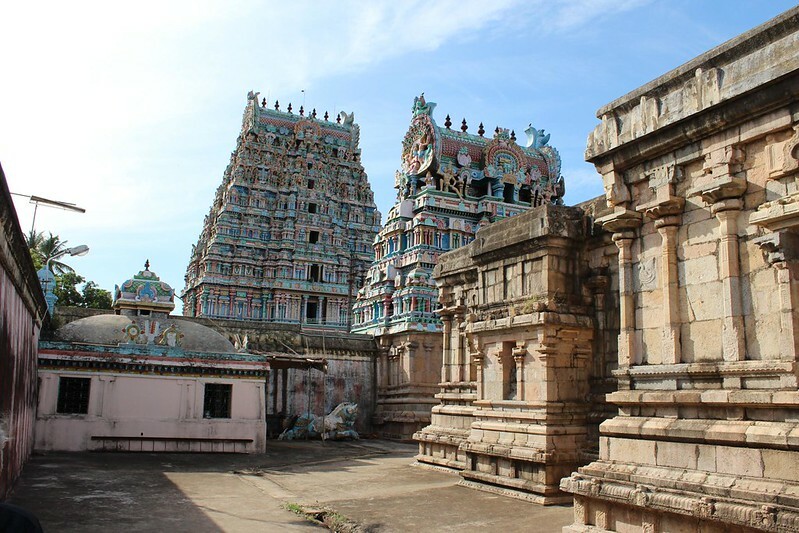 Shrines for Lord Srinivasa Perumal, Azhwars, Nammazhwar, Udayavar Acharya Sri Ramanuja, Lords Sri Rama and Rajagopala, Sri Anjaneya, Sri Andal, Mothers Rukmini and Satyabama and Lords Narasimha and Balasaranatha are in the inner prakara of the temple. 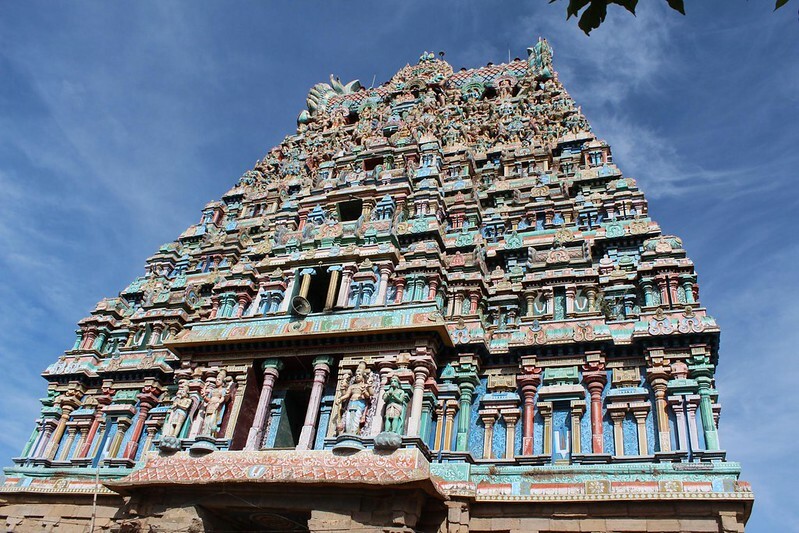 This is one of the oldest temples with a majestic rajagopruam of 120 feet height was built by Nayak King Azhagiya Manavala Nayakar of Thanjavur. Nayakas were fervent devotee of Lord Vishnu. The King who was ruled this city decided to construct a grand temple for Lord Sri Rajagopalaswamy in Mannargudi. He ordered to one of his chief officials Narasa Boopalan to carry out the work of Sri Mannargudi Sri Rajagopalaswamy temple immediately. Narasa Boopalan was an ardent devotee of Lord Saranatha, he was enthusiastic to renovate Lord Sri Saranatha temple in Thirucherai too. While the work was in progress transporting stones and materials required for the construction work, some of them were unloaded in Thirucherai at the instruction of Narasa Boopathi. Suspecting this action, the King carried out an unexpected visit to this temple. Narasa Boopathi passionately prayed to Lord and to the utter surprise of the King could visualize Lord Rajagopalaswamy before him in this sacred place. The most delighted King allocated abundance of funds for the construction and renovation of this temple. The legend has that Lord Brahma was instructed by Lord Sriman Narayana to preserve the chronicles of creation and Veda before the entire world get cleaned out in deluge. At the instruction of Lord Vishnu, Lord Brahma started to create a unique pot, but he was not succeeded at his task. Finally, Lord Brahma helplessly approached Lord Vishnu, Lord Brahma was advised to collect sands from this sacred land and craft a pot. Thus, Lord Brahma crated a pot with this mystic sand and preserved Vedas and tools of creation. Another legend has that River Ganga and River Cauvery had a heated argument about their supremacy. River Ganga was very certain about that she is the superior amongst all the rivers. River Ganga was originated from the feet of Lord Sriman Narayana and was carried by Lord Shiva on his head. River Ganga and River Cauvery approached Lord Brahma to get their disagreement sorted out. Lord Brahma pronounced that River Ganga is the superior amongst all the rivers. River Cauvery was deeply disappointed at this, Lord Brahma instructed her to undergo penance praying to Lord Vishnu in this sacred land to get her status equal to River Ganga. River Cauvery underwent severe penance praying to Lord Vishnu in Thirucherai. Lord was pleased at the devotion of River Cauvery and blessed her with equal status to River Ganga and affirmed her as one of the sacred rivers. River Cauvery earnestly prayed to Lord to remain in this sacred land forever with the appearance as Lord Saranatha. The temple is one among the 108 Divya Desas of Lord Perumal. This is the only temple where Lord Perumal graces the devotees with five consorts – Sridevi, Bhoodevi, Mahalakshmi, Saranayaki and Neeladevi. The soil of the place contains high properties (Saram), hence Lord is called Saranathar and the place Tiru Charam which later changed as Tirucherai. The temple celebrates Thai Poosam in January-February for 10 days. Car festival takes place on the final day. The darshan granted to Mother Cauvery took place during the Jupiter transition time. Jupiter transition from one zodiac sign to the next takes place once in 12 years. This happens in Thai (January-February) on Poosam star day once in 12 years. Bathing in Sara Pushkarini this day is considered equal to a bath in the Maha Magam day in Kumbakonam. 06:00AM - 11:00AM and 05:00PM - 08:00PM. All buses between Kumbakonam and Tiruvarur run through this place. Contact: Sri Ramudu Bhattar – 9444104374 ; 0435-2468078 ; 0435-2468001.